The Spring Intermediate Wednesday season will play at The Gym at West End in Allentown starting March 13th. Games will play on Wednesdays, and game times will be start at 6:30pm. The bar sponsor for the season is TBA. 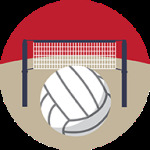 Check out this Volleyball (Indoor) league '19SPR - VOLLEYBALL - INDOOR INTER. COED (RATIO 3:3) - GYM @ WEST END (WEDNESDAYS)' with Lehigh Valley Leagues!